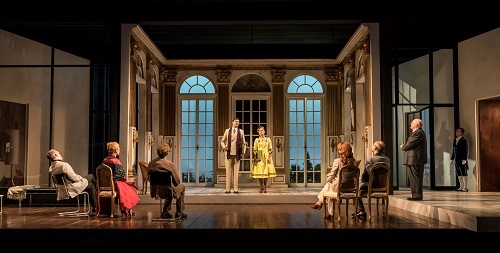 In the first part of Garsington’s season this year, it is apt that performances of Richard Strauss’s last opera, Capriccio, alternate with those of his beloved Mozart. Although the latter is not referenced in Strauss’s work, Capriccio conjures up the world of the 18th century: it alludes in general to the cultural and artistic context in which Mozart emerged, and discusses in particular the perennial question addressed implicitly by all creators of music drama, whether it is the words or the music which is the more important. That question is also embodied symbolically in this opera by the competing romantic attractions which the composer Flamand, and the poet Olivier, hold for the Countess Madeleine, providing a corresponding human dimension to this otherwise rarefied and abstract matter. Although this production by Tim Albery goes in for the common, even clichéd, directorial conceit of setting the work at the time of its composition (in this case 1941-2, in the midst of war, as Robert Carsen’s production for Paris did in 2004) it perhaps takes its justification for doing so from Clairon’s words to the Countess near the end of the opera: “in your salon the hours pass, yet time does not age”. The set is largely focused upon that self-contained salon, designed in authentic Rococo fashion, whilst the rooms to each side suggest the more modern era with their more minimal décor. The abstract painting in one of the rooms is later replaced by an 18th century portrait of a lady with a lyre, perhaps anticipating the choice between Flamand and Olivier which the Countess will have to make, as well as indicating the centrality of the arts to this household. There is no actual indication of warfare in the world at large during the course of this enactment, which may seem a glaring omission. But on the other hand, it is surely a telling comment that the perpetuation – or revival – of the artistic refinements of 18th century civilisation appear to keep that barbarity at bay, just as it showed a certain confidence and consistency on the part of Strauss and his librettist, Clemens Krauss, to retreat into this milieu in response to that war as it actually raged around them, and stands as their artistic manifesto against that horror. Some have argued that it was rather a self-indulgence and a moral failure to withdraw into that, but surely they did as much or as little in upholding the values of civilisation within the terms of their talents as all those who went about their civilian lives as normal at the same time, be they doctors, lawyers, teachers, carpenters, shop assistants, and so on. Not having presented Capriccio since 1994, Garsington continues to cement its Straussian credentials under Douglas Boyd’s baton in this performance that pulses with the luxuriant sweep which is demanded by this score from the composer’s Indian summer, but also exudes a Mozartian translucence, and so remains lithe and dynamic. The joins between more lyrically or orchestrally rich sections, and those of a more declamatory or recitative-like nature, are moulded seamlessly enough; there is palpable urgency and drama in the ‘dispute ensemble’ of the second part; and the moonlit terrace scene at the end avoids cloying sentimentality. The members of the Royal Academy of Music who comprise the onstage sextet with which the opera opens should also be commended for the warm playing and compelling arc of their account of the prelude, which holds the attention for its seven or eight minutes, despite little else taking place around it, other than La Roche’s ostentatious contriving to fall asleep during it. Miah Persson delivers a radiant, mellifluous account of the Countess, with a dignified charm and restraint that reveals the role to be a close relation of Der Rosenkavalier’s Marschallin. She presides over the increasingly fraught squabbles among composer, poet, theatre manage, and other participants without strain. By contrast Andrew Shore is a bluff though also raffish La Roche, but equally unyielding in the pursuit of what he wants, and Shore conveys compellingly the directness of his character through the music and a somewhat reedy tone. Sam Furness sounds rightly attractive and gentle as the composer Flamand, eliciting sympathy and good will in voicing the claims of music, in contrast to which Gavan Ring makes a more forceful and impetuous impression as the poet Olivier, and seemingly more defensive therefore, sparking some amusing contretemps between the two of them. Controlled as the orchestral support is, though, there are occasions when Furness struggles to be heard over it, falling victim to La Roche’s complaint elsewhere that in opera, music often drowns out the words. William Dazeley’s Count is down to earth and witty, a good counterpart to La Roche in standing for a certain practical disposition, as against the more aesthetically-inclined aspirations of his sister the Countess, Flamand, and Olivier. Hanna Hipp brings allure and good humour to the role of Clairon, whilst Nika Gorič and Caspar Singh make little fuss as they execute the overblown vocal acrobatics of the parody of an Italianate song allotted to them. 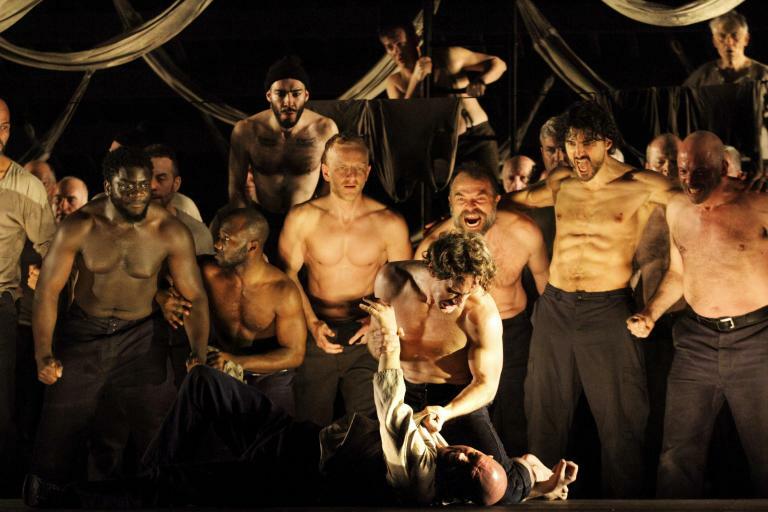 For all the surface charm of the opera and this production, there is much in it that will stimulate any audience that cares about music drama at all and the mechanics at work within it; it is therefore a welcome contribution by a festival whose raison d’être is opera.